Every tribe loves playing at the park – it’s free, it’s fun, it encourages developmental growth and it’s great to get the kids outdoors and playing. 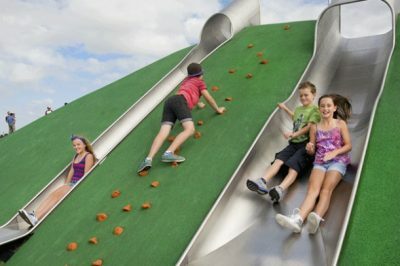 So we compiled a list of Entertain My Tribe’s favourite playgrounds in Australia that are at the top of our list to try this year. 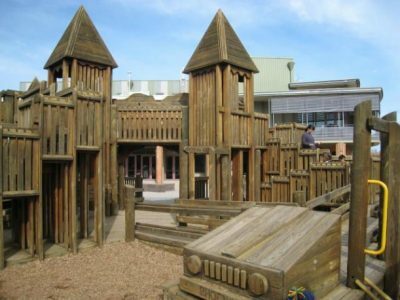 WHAT WE LOVE: This fort style playground was built to entertain both big and small kids. It has everything from climbing structures, to a sandpit. It includes 10 swings of different types so chances are you won’t have to wait too long to have a turn, and it has loads of levels to explore. WHAT WE LOVE: This park is not only an architect’s dream, but it has so much for the kids to interact with. It includes acorn cubbies which are elevated up on stilts, giving the kids spectacular views when they get to the top. The cubbies are connected by net tunnels, with one acorn boasting a large spiral slide, and another that has a smaller slide suitable for smaller kids. It also has two large nest swings and two toddler swings. WHAT WE LOVE: This gorgeous park has two towers for climbing, the tallest is three storeys high and the smaller is two storeys. The taller of the two has an enclosed slide for express arrival to the bottom of the park, and the smaller tower has a fireman’s pole which can be equally as thrilling. There is also a series of rope challenges at this park and of course, plenty of sand for digging and playing. WHAT WE LOVE: Spread over 3 hectares, this is Sydney’s biggest and most diverse park! 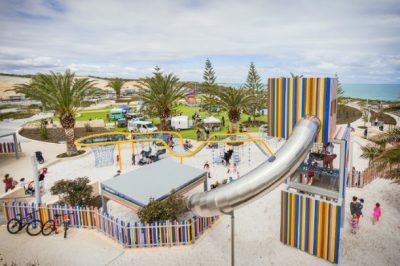 It has everything from water play, a swing station, a slide hill which doubles as a climbing wall, flying fox, viking swing, spinning disk, cubby holes and so much more. This park has something for every age and ability. 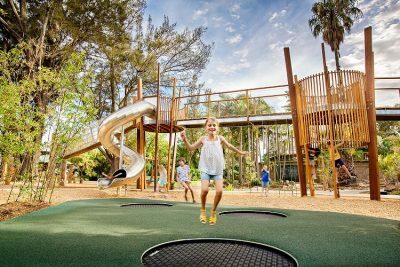 WHAT WE LOVE: This park has been beautifully designed to enhance nature play, with the playground design incorporating existing trees into its layout. 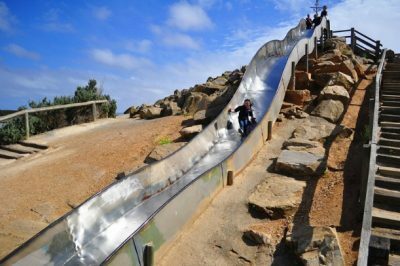 There are lots of fun elements of this park for the kids to discover including mounds, tunnels, slides, water play, a flying fox, climbing frame and balancing logs. It also has unique steel pods built into the playground which house beautiful greenery and provide a fun hiding space for kids to explore. 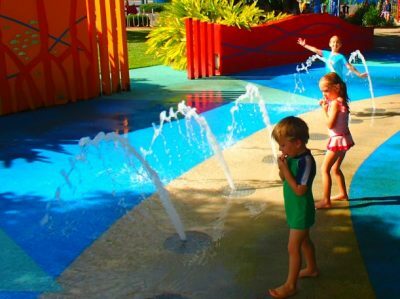 WHAT WE LOVE: This fun park is iconic in Cairns and one that you must visit with the tribe when you’re in the area. It has the iconic Muddy’s fish sitting in the centre of the water play area, so you can’t miss it! But this fun park also includes a rope bridge, story telling area, sound chimes, slides, see saw, puzzle games, flying fox and track ride. There’s plenty of fun to be had at this excellent playground. WHAT WE LOVE: This magnificent playground was created to stimulate all the senses. It includes climbing structures, water play features, an aerial bridge and a natural creek bed that runs through it. 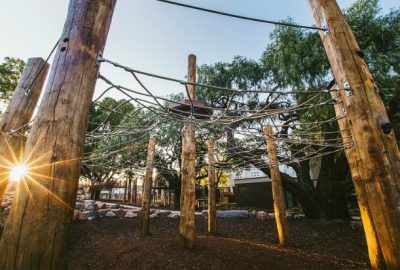 When the kids climb up to the aerial walk way, they will get a bird’s eye view of Adelaide Zoo and all of it’s animals. 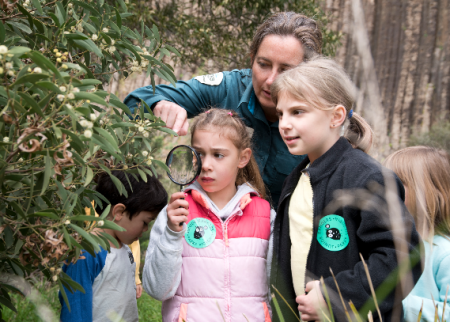 Kids are encouraged to build forts with sticks and branches in the nature’s playground, and they can get up close to tadpoles, fish and frogs in the creek! WHAT WE LOVE: This park is as majestic as it is fun. A giant castle perched on top of a hill, what tribe wouldn’t want to explore this amazing playground? Climb the stairs and check out the sights from the multi-level tower, and enjoy the huge wave slides that make the epic stair climb worth the effort! There is also a shipwrecked pirate playground nearby which is also sure to keep the tribe entertained. WHAT WE LOVE: This park was newly opened in April last year and it’s well worth a visit with the kids! It boasts a climbing tower, giant slide, tunnels, nets and swings. 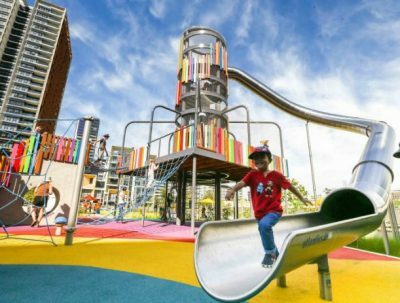 It is also one of the most colourful playgrounds we’ve ever seen, because it was literally a work of art created by Sydney artist Nuha Saad, who worked closely with the architects and landscapers to ensure the park was as beautiful to experience as it was fun to play in! 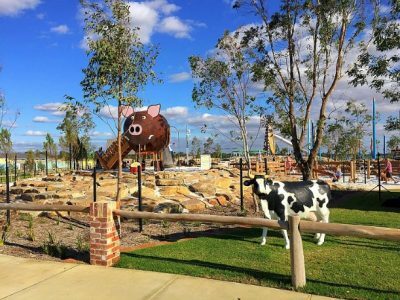 WHAT WE LOVE: This farm themed park is like no other we’ve ever seen. 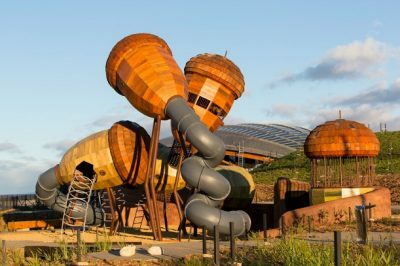 It has an 8.5m tall windmill which doubles as a slide, a 35m double flying fox, a fence maze and swings galore. But one of the sweetest inclusions is the animals all around this playground. You’ll see cows, dogs, pigs and sheep all positioned around the sandpit and along the grass. There’s also a pig slide custom built for the little ones of the tribe.